The SilverStone SX600-G SFX obviously is very small compared to an ATX PSU, measuring in at the SFX standard dimensions of just 125 × 63.5 × 100 mm (W×H×D). Due to the limited internal volume the SFX form factor affords, most SFX PSUs come with a 60mm fan, so imagine our surprise at finding an 80mm fan in the SX600-G. Having a larger cooling fan fit into the SFX form factor and on top of that managing to fit large enough components to reach an output of 600 Watts with 80Plus Gold efficiency levels seems like quite an engineering feat. Meanwhile the small body is sprayed with a satin black paint that is fingerprint resistant. SilverStone made the odd move to punch their company logo at the top side and place the sticker with the electrical specifications and certifications on the left side of the chassis. It is likely that the company expects the top of the PSU to be more frequently visible than its side, but such aesthetic improvements are of questionable value on such products, as SFF and desktop cases rarely have windowed panels anyway. Meanwhile there is nothing of importance at the rear side of the unit, not even an on/off switch. Apparently, every bit of space does matter and even a switch would not easily fit inside such a densely packed design. The few connectors for the modular cables can be seen at the front of the PSU. The thin 80 mm fan of the SX600-G SFX PSU is supplied by ADDA, one of the most renowned fan manufacturers. The AD0812UB-D91 is a very high speed model, capable of reaching a maximum speed of 4800 RPM at 12V input. And although that sounds like a scary number compared to the speeds of 120/140 mm fans found in larger PSUs, it is not dramatic for an 80 mm fan. As with the vast majority of such high speed models, it has a ball bearing. The OEM behind the very densely packed design you see below is Enhance. Enhance is not a very common manufacturer for high output PSUs, but they do specialize on SFX/SFF and proprietary PSU designs. It is so densely packed that it is very difficult to make head or tails of what components are being used without at least partially dismantling it. There is a PCB attached to the back of the AC receptacle with half of the filtering stage components on it, while the other half is on the main PCB. There are a total of four Y capacitors, two X capacitors and two filtering inductors. For safety, there is also a metal oxide varistor and a simple glass fuse for limited surge protection. Due to space restrictions, Enhance had to keep things relatively simple. The SX600-G is based on a simple half-bridge active rectification design, with two MOSFETs feeding the main transformer. The rectifiers at the secondary of the main transformer generate only a 12V line and the minor 3.3V/5V lines are converted from it using DC-to-DC conversion circuits. By replacing passive components (diodes) with active components (transistors) and using DC-to-DC circuits for the minor voltage lines, Enhance improved the efficiency of the SX600-G without having to use "exotic" technologies or much more expensive parts. The primary APFC capacitor is a high quality product supplied by Nippon Chemi-Con (450V/330μF), but there is complete chaos at the other side of the transformer, with the rest of the capacitors coming from no less than six different brands. We saw electrolytics from Elite, Teapo, Rubycon, SunCon and Su'Scon, while the polymer capacitors are supplied by Gemmy Electronics and G-Luxon. It appears as if half of Asia came together to build this PSU. The assembly quality is rather good, considering the very small proportions and density of the unit. From personal experience, the SATA cables they include aren't suitable in their own cases, at least not in RVZ01. Right angle SATA connectors are completely inferior compared to straight ones inside cramped cases, because the "T", that theconnector forms with its cables, gets in the way more often than not and causes a lot of stress onto the drive connector or the cables. no you don't? There are daisy-chained straight SATA connectors. This was a pretty standard type of connector found on older PSUs, but for some reason, I haven't seen many, and by that I mean none, these days. You see, the problem with right angle connectors, is that you need accommodate the minimum bend radius between the drives anyways, because these connectors aren't spaced to the typical drive spacing. both types of connectors suffer from the same problems with Minimum Bend Radius, just in different situations. 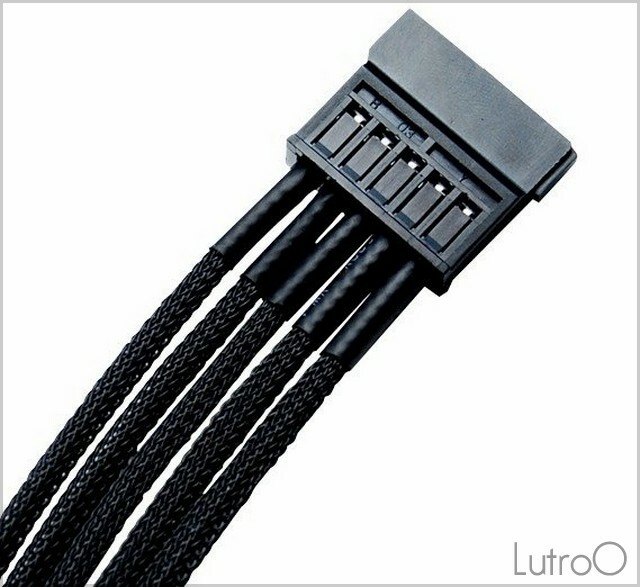 as for daisy chaining straight connectors, I haven't seen one with several straight connectors, I don't see how that would even be possible. The one you show just shows a single connector at the end like typical straight connectors, not several daisy chained together like you can have with the 90° cables. So in summation, if you want a 600W SFX power supply you have to buy this one. Actually, Athena Power has a bunch of SFX PSUs that are over 600W and they even have an 800W model. Silverstone is also going to release a 700W model of their SST-SX500-LG, although, strictly speaking, these "Long" models don't conform to SFX standards. First off, thanks for reviewing power supplies of lower wattage and it's great to see Anandtech taking a look at SFX PSUs in particular. Not all of us are interested in 1000 watt supplies so the variety is great. 2 year ago i looked for SFX PSU and only choice was Seasonic 300W and even with 30W power outcome was noise. So i moved into expensive picoPSU and after that for second very small machine i selected board with laptop like external adapter connector and adapter bundled with Akasa Euler S.